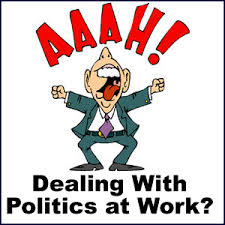 Work politics … don’t we all know about these! We cannot choose our family but they are our flesh and blood. We chose our friends which is fabulous. Work colleagues are a whole other kettle of fish. In my working life, I have built some solid relationships with my peers and they will forever remain in my phonebook. I have also been in many situations where my work colleagues are just not my cup of tea. Difference in opinions, culture, work ethics and personality traits can sometimes lead to clashes and in worst case scenarios result in very volatile working situations. How we handle these situations is imperative to how we affect our reputation and work credibility. Once upon a time a girlfriend of mine worked in an IT solutions company. The office was primarily male dominated and tight knit. Office banter between my friend and the boys was part and parcel of the working environment, however an over amorous and overbearing managing director unfortunately caused some issues within the company. He flitted between dishing out unacceptable sexual innuendos to being quite aggressive to the girl. My friend, hot headed at the best of times handled the conflict less than professionally. Rather than approach another manager to address the issue she engaged in shouting matches with the perpetrator. It resulted in colleagues questioning how credible she was as to them she appeared very argumentative. Rather than confiding in another work colleague and following procedure for such matters accordingly she instead embarked on a hate campaign against the managing director and ended up leaving the company some months later due to stress and lack of support in the work place. Work politics, big or small are unfortunately alive and kicking in most work spaces across the country. I have compiled a suite of scenarios that might crop up and how you can best handle them. Your work colleague smacks you on the bum. Refrain from socking him. Although this might feel like the right thing to do it is just fighting fire with fire. In a calm and professional tone, explain to him that this is not appropriate and that his behaviour has made you uncomfortable. If you feel he is not taking you seriously, escalate the matter to management. Your peers are bitching about a colleague or manager and they are trying to engage you in the conversation. Refrain. As difficult as this can sometimes be, bitching and idle gossip can get you into trouble in the work place. While you may form bonds with colleagues you need to remember that first and foremost they are part of your professional life and not your personal one. Keep opinions on others to yourself and politely decline to get involved in office politics. Your colleague at the next desk has some unfavourable hygiene policies and bad habits. Think farting, nose picking and body smells to rival a wet dog. You should not have to put up with someone’s poor hygiene but it is important that you protect their dignity and do not highlight their pong/flatulence in front of an audience. Instead take them to one side and politely explain your grievance to them. It is awkward and embarrassing but you will be doing said smelly person a favour in the long run. You are footing the bill for the cappuccinos for the third time this week because Fred in marketing keeps conveniently disappearing when it is his turn to pay. This is a scenario where you need to be a bit tough. Locate Fred in the men’s cubicle/ janitor’s closet and ask him to cough up. The situation does not call for you to be rude. Innocently point out that the coffees are on him today. If he weasels out, well then he might have to be omitted from future caffeine fix runs. These are a small selection of some issues that can crop up in the work place. Let us know about any difficult work situations that you experienced and how you handled them.